This 40J model is in exceptional condition and has been beautifully maintained by the previous owner, the full body paint scheme in gunmetal grey and silver with several coats of clear is simply spectacular and like new, the two opposing slides in the front create an apartment like living space and sleeps four comfortably. The full tile flooring is easy to maintain and keep clean. 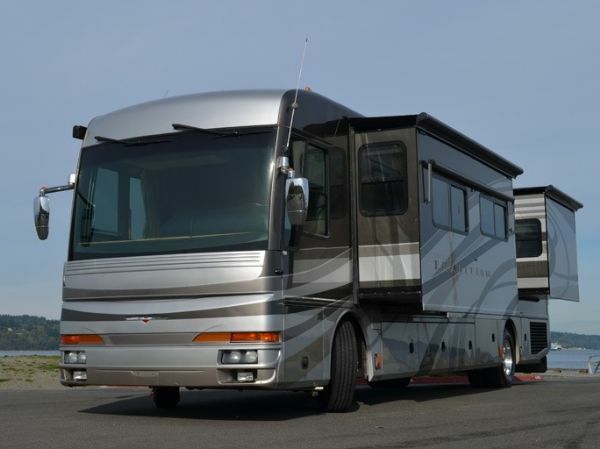 To top things off this coach is also equipped with a newer (2013) set of Bridgestone tires, a $6,000.00 value.If you have never explored an American Coach then you have not seen one of the industries best built motorhomes! Many owners of American Coach products have never owned anything else simply because when you compare an American Coach with any other brand including Monaco, Newmar and Tiffin, the competition just comes up short. The fit and finish is superb, the interior cabinets are beautifully crafted, the basement storage compartments have laminated liners they are huge and functional, the Spartan chassis is one of the best in the industry and the foundation of this beautiful coach and the seating is all real leather not Ultra leather found in the competitors coaches, these are just a few of the things that make the American Coach Tradition one of the most sought after coaches on the market.Three camera rear vision system, Multiplex switching system, solid cherry cabinetry, lined drawers and cabinets, ceramic tile backsplash with accents, solid cherry pocket doors, quilted bedspread, queen bed with under storage, day night shades, remote generator start switch, cedar lined wardrobe, Sony color camera monitor, smart steering wheel with cruise and wiper controls, driver and passenger shades and visors, one piece windshield, power driver window, halogen headlights, adjustable pedals, air horns, shower skylight, china bowl toilets, hydraulic step well cover, 12 volt LED ceiling lights, dinette storage, folding chairs, auto generator start, inverter and battery monitor, track vision "in motion" HDTV satellite antenna, convection microwave, sink and stove top covers, variable speed water pump, whole coach filtration system, dual holding San-T-Flush system, side docking lamps, dual propane furnaces, dual 15,000 BTU air conditioning and heat pump on rear, holding tanks with low point drain valves, air service line, boxed end slide out awnings and bus style chrome mirrors.